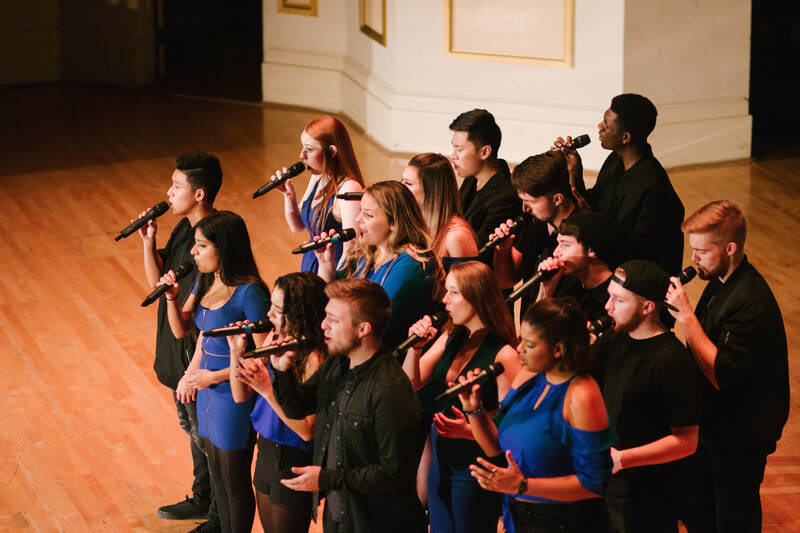 Whether it's garnering nearly two million views on their viral "Disney's "Hercules" Medley" video or making waves at ICCA in their signature black and blue attire, you can be assured that No Comment A Cappella is finding a way to stand out from the competition. And this past ICCA season they did just that by advancing once again to their region's Semifinal round. Now, the coed group from the University of Illinois at Urbana-Champaign is planning on standing out from the rest once more as they take over our Facebook page as the next hosts of "Aca Live." See the group perform live tomorrow night at 9 PM/CT. In the meantime, get to know the group with immense personality in our exclusive interview below. No Comment was founded in 2004 by Mark Silverman, a student at the University of Illinois. It was originally called Guys and Dolls, however, that was also the name of the musical that year, so they had to change the name. They asked their auditonees what they think the group should be renamed and one person answered, “No Comment,” and the name stuck! We have always done a variety of music, but we had one music director, Robby Shellard that really shaped our sound to what it is now. 2. What makes No Comment so special? What makes members join the group versus looking into other student organizations? There are eight different a cappella groups on campus and they are all extremely different. When people audition, they should take into account the group sound, the genres of songs the group sings and the overall group dynamic. With NoCo, we are a very high energy, competitive group. However, we are also very close-knit. We live together, hang out together and study together. It really is like a family. Last year we had the opportunity to perform at Marquette university’s Acatoberfest and it will always go down in the books as one of our coolest performances. There was a surprise light show with fog, the sound was FIRE, and the audience was electric. Truly unforgettable. 6. When it comes to fashion, the No Comment black and blue style has consistently remained one of the best we've seen in college a cappella. What tips do you have for groups looking to find their own signature style or make waves with their wardrobe at major competitions? Consistency. I would say if you are going to go with an edgy look, everyone should commit to that edginess, or if you are going for a formal look, everyone should commit to that formalness. The most important thing is for everyone to feel confident on stage, and half of that is in how you look and feel. Taking some extra time to plan out outfits is worth it! YES! We are planning on releasing a video of our ICCA set and also an EP with 4-5 songs this summer! We haven’t recorded in four years, so we are super excited to get into the studio again! 8. No Comment recently took first place at their ICCA Quarterfinal competition. How does it feel to be advancing to the ICCA Semifinals for the fourth year in a row? What's the secret to your success? The most rewarding part about being in a college a cappella group is the people you meet. College is scary and huge, and it makes the town a little smaller. I found my best friends in this group. Not only did I make friends in my own group, but I made friends with people in a cappella all throughout the country. Going to competitions and being on Sing It On (a docu-series filmed about ICCA that we were featured on in 2015), we had the opportunity to meet a lot of people involved in a cappella. Although college a cappella is the best thing I decided to do in my college career, it also was one of the most challenging. The time commitment can be rough if you don’t manage your time well. We rehearse nine hours a week and even more during competition season, so if you don’t get your homework done in time, you are out of luck. All of us have a different taste in music, but we all love the classic singers of our generation (Miley Cyrus, Demi Lovato, Sam Smith). There is definitely a fight for Bluetooth access! 11. Lastly, could you give us some background info on this image from your Instagram? This picture is from our bonding weekend! Bonding weekend involves turning off your phones and really getting to know the members of No Comment. It is most geared towards the new members (which we took seven of this year!) We do bonding weekend towards the beginning of the school year to allow the new members to get to know the old members and each other. We go to the apple orchard, corn maze and play fun bonding games. This is the weekend we transform from group mates to friends. For more information on No Comment, connect with them on their website, Facebook, Instagram, Twitter and YouTube.